Hrm. I didn't even know that my microwave had that setting. COMMENTS for WHAT'S FOR DINNER? How did you do that Josh? ha... it's actually a child safety setting on the microwave. 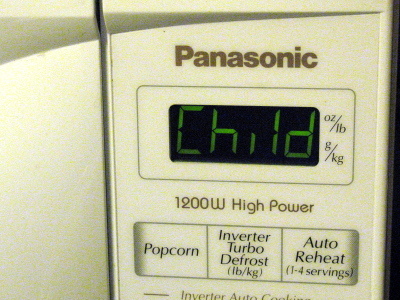 If you hit a bunch of buttons at random, the microwave assumed you are a child and locks down and displays "child" to let you know that it's in safety-mode.